Are you starting out on a health and fitness journey which involves upping your protein intake? Wherever possible, it is always best to try and consume protein in your daily diet from foods such as meats, fish, eggs and nuts. However, if you have a goal in mind that needs a helping hand, such as bodybuilding or extreme weight loss, protein powders work as a really handy supplement when trying to achieve those goals. The most common type of protein powders are typically made from whey. We recommend trying to find one that is 100% whey, and check what other ingredients are in the powder to be sure it’s the right one for you. The whole point of protein powders in to consume protein, so the less carbs, sugars and fat in the powder the better. For a slower release of protein, casein is the better one to go for and it is often taken before bedtime and then you’ll feel the benefit in your morning workout. If you are a vegan, then there are also a range of non-whey and non-casein products available on the market. If it’s your first time trying protein, it can be useful to order a few sachets first so see what you like. Think about the flavour and consider mixing and matching if you’re trying to bulk up a lot. If you pick something you don’t like it will only end up sitting in the kitchen cupboard for years to come and you’ll never get anywhere. You can get a range of standard flavours such as chocolate, vanilla, strawberry and banana, but more adventurous flavours are beginning to emerge now that protein has become so popular. Once you know what you like, it can be handy to order in bulk to save some pennies. This whey powder by Optimum Nutrition is a great all-rounder and a good value for money option if you’re just starting out on protein. There are a whopping 24 different flavours to choose from including ones such as ‘birthday cake’, ‘rocky road’ ‘cookies and cream’ and ‘chocolate peanut butter’. If these sound a little too sweet for your liking, they also do plenty of standard flavours such as vanilla and strawberry. Overall, this is the best protein powder for supplementing any fitness regime. This grass fed whey protein powder is great for those who want a low-carb option that will help them bulk up, and is particularly good for those who are training for a competitive sport. This is one of the most natural protein powders available on the market which is designed to improve your strength, size and body mass quickly and effectively alongside a healthy diet and regular training. Casein protein is the ideal slow-release for providing you with all the essential amino acids while you sleep. Ideally, this protein powder should be consumed before bed, or between balanced and healthy meals. These shakes are quite thick in consistency, but are designed to keep you fuller for longer and help you gain strength when pushing yourself further during training. If you need a helping hand to achieve your goal weight, then the Slimzest High Protein Diet Shakes work wonders in giving you the boost of nutrients you need. These are designed for meal replacement so that even when eating less you get the essential vitamins and minerals your body needs to stay fit and healthy. You can also use these as a snack or a pre/post workout supplement. 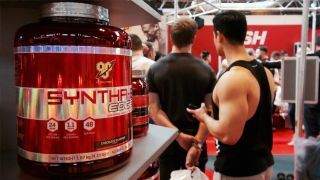 For those of you who have tried protein powders in the past and absolutely cannot stand the flavour, The Syntha-6 by BSN is going to be one of the best protein powders for taste. Their luxury flavours such as salted caramel are a game-changer in the training world, and they’re low in sugar! Perfect for muscle growth and recovery, we think this protein powder is worth the extra pennies. If you’ve been considering protein powder to bulk up but don’t know where to look because you’re vegan, then look no further than Vegan Protein Extreme. This is a tasty powder made from a range of alternative sources such as Pea or Faba Bean. The flavours are a little limited but the quality is great and they work extremely well for all kinds of training regimes. For those who are looking to gain weight quickly to help build muscle, then this Mass Weight Gain Powder is another great product from Optimum Nutrition. Each shake contains 1,250 calories and 250g of carbohydrates to help fuel intense workouts. If you struggle to gain weight with a fast metabolism, you’ll be able to make serious gains safely and remain healthy as there is no added sugar and each serving includes essential vitamins and minerals you require in your daily diet. Looking for other ways to support you training routine? Our guide to the best muscle toning machines will help you enhance your workouts.